In June of 2016, Paséa Hotel & Spa opened as the newest addition to the Meritage Collection’s portfolio of lifestyle and luxury hotels and resorts. The team at Pacific Hospitality Group collaborated with Deep Blue to design and implement a hotel WiFi solution that was both cutting edge in design and future proof to allow the convergence of the hotel’s network to support multiple services and applications. The new Paséa Hotel & Spa is located on the Pacific Coast Highway overlooking the Pacific Ocean and is steps away from the iconic Huntington Beach Pier and Pacific City, the area’s premier retail and dining hub. The property features 250 beautifully-appointed ocean view guestrooms and suites; Tanner’s – a signature restaurant with a rooftop deck bar; Aarna Spa, a Balinese-inspired spa with indoor and outdoor treatment areas and state-of-the-art fitness facilities; and two swimming pools. Serving as one of the newest venues for memorable special events and business meetings in Southern California, Paséa also offers 11 meeting rooms and more than 34,000 square feet of oceanfront event space. The hotel takes inspiration from the vibrant artistic culture and communal spirit of the area. Create a world-class resort with the most sophisticated technology to accommodate all hotel guests. During the design of Paséa, Pacific Hospitality Group wanted to create a world-class resort with the most sophisticated WiFi technology solution to accommodate all of their guests – from business and vacation travelers to large scale conferences. With too many SSIDs and different brands of equipment that didn’t work well together, there was frustration with connection problems and difficulty conducting daily business. Pacific Hospitality Group engaged Deep Blue Communications to engineer and install a state-of the-art WiFi network for Paséa. The team at Pacific Hospitality Group collaborated with Deep Blue to design and implement a standard hotel WiFi network that was both cutting edge in design and future proof to allow the convergence of the hotel’s network to support multiple services and applications. In addition to excellent WiFi for hotel guests, the team at Pacific Hospitality Group needed to ensure the connectivity and support were up to the task. A network that takes care of all of the hotel’s needs. This is hotel Wi-Fi done right. The fully redundant network at the property can support all of the technology – including phone, TV, computers, sound systems, PMS and business systems with no spikes, and has a built-in reboot system that automatically resets and brings itself back up and running when needed. Support on the network is 24x7x365, with a US-based help desk. The staff at Paséa is now able to offer an extra level of service to guests utilizing their hotel WiFi network – avoiding long check-in lines and making guests feel right at home immediately. 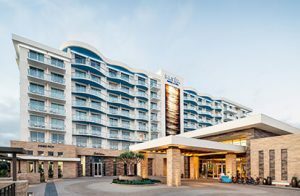 Looking ahead, Pacific Hospitality Group and Deep Blue Communications will continue their partnership to upgrade each of the Group’s properties. Learn more about our Hotel WiFi services, support and installation, or call 1-844-544-3826 to speak directly to a Deep Blue Representative.